BRITTANY HOFMANN | THE SPECTRUM NDSU has struggled to just one win outside of Fargo this season. 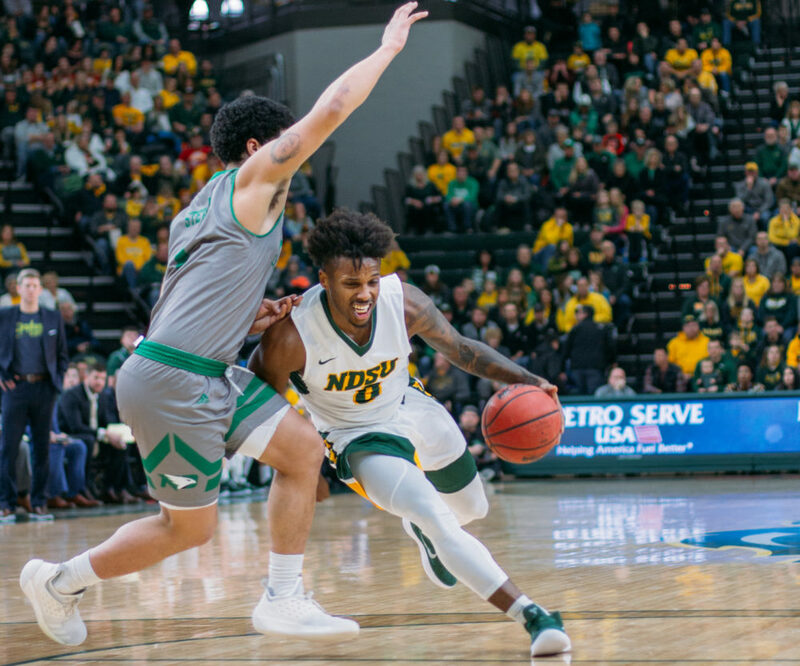 The North Dakota State men’s basketball team is currently riding a wave of momentum after holding out to beat North Dakota over the past weekend. Now sitting mid-table in the Summit League at 3-3 in the conference, the Bison pack up for a long road trip. NDSU will play four straight games away from Fargo in a crucial stretch in the search for a top seed. So far, the Bison have only complied a single win outside of the SHAC. The search for the first away win in the Summit will be a challenge, but possible on this trip. The first game on NDSU’s road stretch is against the South Dakota State Jackrabbits. The Jackrabbits currently sit atop the Summit at 5-1 in conference play. The team’s overall record is 15-6. With eight days without games, SDSU will be coming in with both a lot of rest and extra preparation. This comes along with their strong home-court advantage. SDSU is 8-1 in home games. The key player to look out for on the Jackrabbits will be Mike Daum. Daum ranked No. 3 last season for best power forwards. In the past two games, he has scored over 30 points and has six Summit League Player of the Week awards this season. NDSU closes out the first week of the trip in Tulsa, Oklahoma facing the Golden Eagles. Oral Roberts is 8-14 overall and has a conference record of 4-3. Their record puts them fourth in the Summit League. In their last game, the Eagles played Denver. Denver broke away from Oral Roberts in a crushing 74-58 loss. It was Denver’s second win in the Summit after beating NDSU last week. The Golden Eagles are also a team that uses their home-court advantage. In their last four home games, the Eagles have gone undefeated. The key player to watch on Oral Roberts is Emmanuel Nzekwesi. The Golden Eagles’ leading scorer did not play against Denver, and it is not yet known if he will be returning for Saturday’s game. The second week on the road starts out east in Macomb, Illinois. The Leathernecks are seventh in the Summit League with a 2-5 record. This is coupled with a 6-3 home game record. Western Illinois’ leading scorer is Kobe Webster, who scores an average of 17.9 a game. NDSU won the first matchup of the season in Fargo comfortably. The Bison had six players in double digits in the early January meeting. The last game on the road for the Bison will be against the University of North Dakota Fighting Hawks. UND was the Bison’s latest matchup this past Saturday. The Saturday game was a close 67-65 victory for the Bison. This put UND at seventh in the Summit League with a 2-5 conference record and a two-game losing streak. Before last weekend’s matchup, the rivalry has been a little crazy with the away team getting a handful of wins. NDSU used 30 points from now-graduated Paul Miller for a 88-79 win in Grand Forks last season.